The latest version of Scene Builder can be downloaded from the Gluon website. 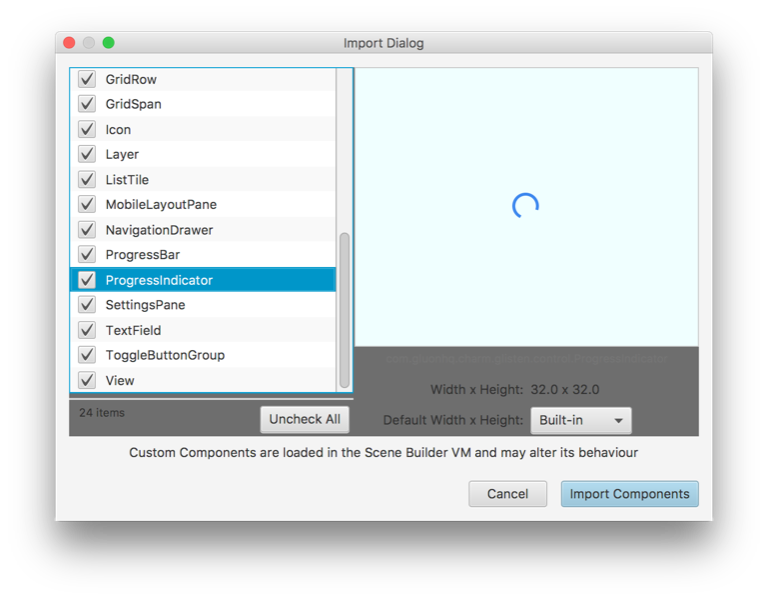 First of all you need to download the correct installer for your plaform from the Scene Builder download page. The installation details are different for each platform but should be straight-forward. As of Scene Builder 8.3.0, the Windows installer will let you choose the installation folder, but please note that you will need to run as administrator (right-click, run as administrator) if you want to install in a system-wide location. Up until Scene Builder version 8.1.1, custom controls could be added with the menu button available at the Library panel. 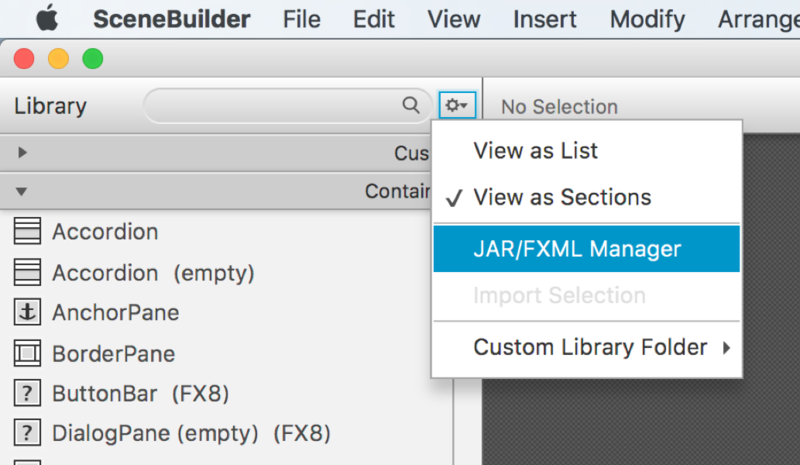 Selecting the option Import JAR/FXML File…​ from the drop down menu allowed the user browsing locally for jar or FXML files in his file system. Those files were added to the Custom Library Folder, a local folder that the user could access and manually add more files or remove them. From Scene Builder version 8.2.0, a new function was added, allowing the user not only to import local jar or FXML files as before, but also to import jars from a number of repositories, remote and local, public and even private ones. To import libraries either from disk or from repositories, the menu item JAR/FXML Manager gives access to a new dialog, and replaces the old menu item. 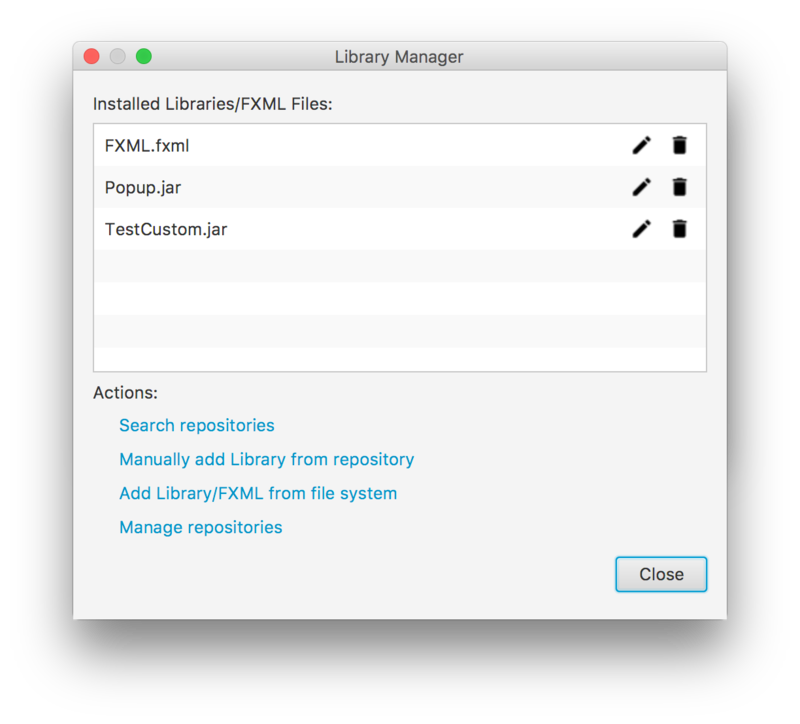 The top part of the dialog contains a list of the existing libraries (jars and FXML files), if any. For each library, the user can edit or delete it. 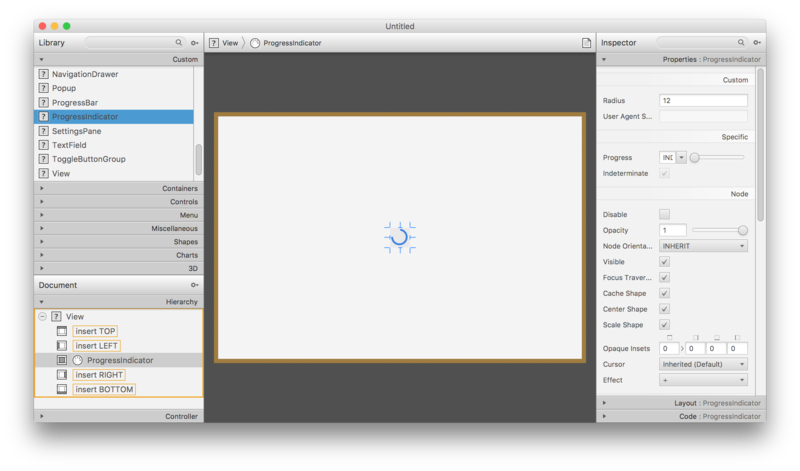 Editing an FXML will open it in Scene Builder. 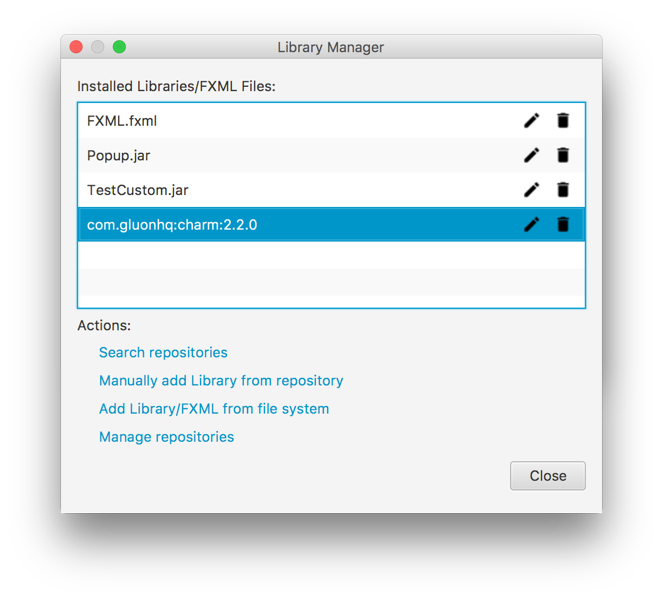 Editing a jar file will open a dialog where the user can preview and select or unselect different components (if any) of that jar that will be added to the Custom panel. On the lower part of the dialog, there are different actions that the user can perform. 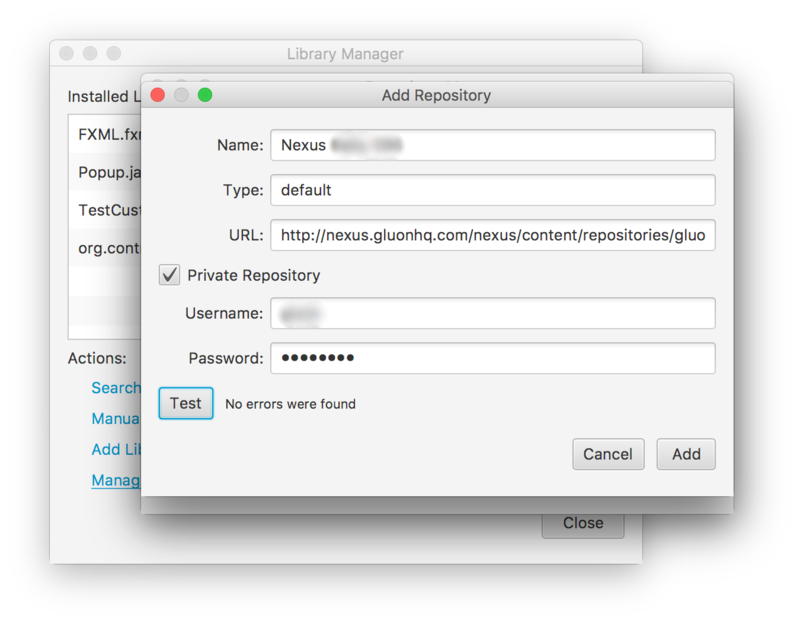 The user can type a name of a library: full name or part of its group id, or full name or part of it of the artifact id, following the usual naming convention. The results don’t include the version number, and this is only retrieved if the artifact is finally installed. Note: Only latest releases will be resolved with this option. For any other version, including snapshots, the user has to use the option Manually Add Libraries from repository (see below). 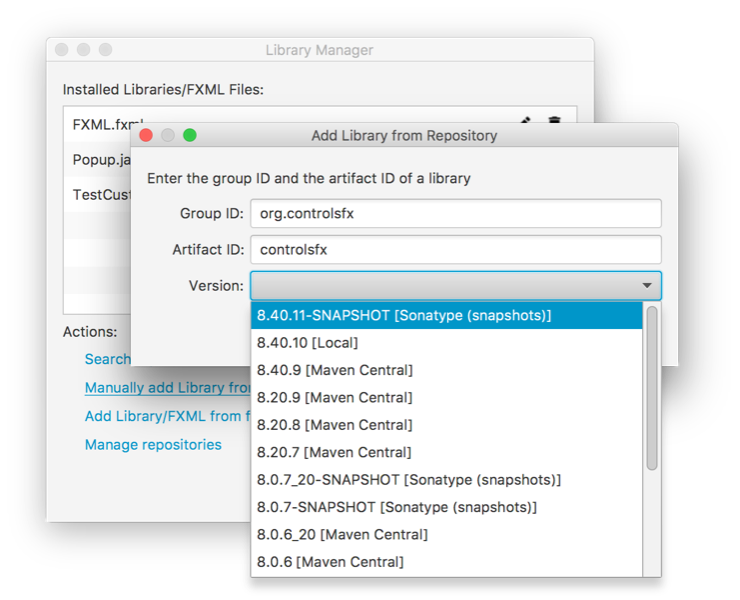 By selecting the desired artifact, and clicking Add JAR, the artifact will be resolved from one of the repositories, downloading the latest release version, and installing it into the local M2 repository. Then the jar will be scanned and a dialog will show any component that can be added to the Custom panel, typically classes that are assignable from Node. The user can select or unselect those components that should be added or excluded from the Custom panel. Also, some components can be previewed. The user has to click on Import Components to finish the process. 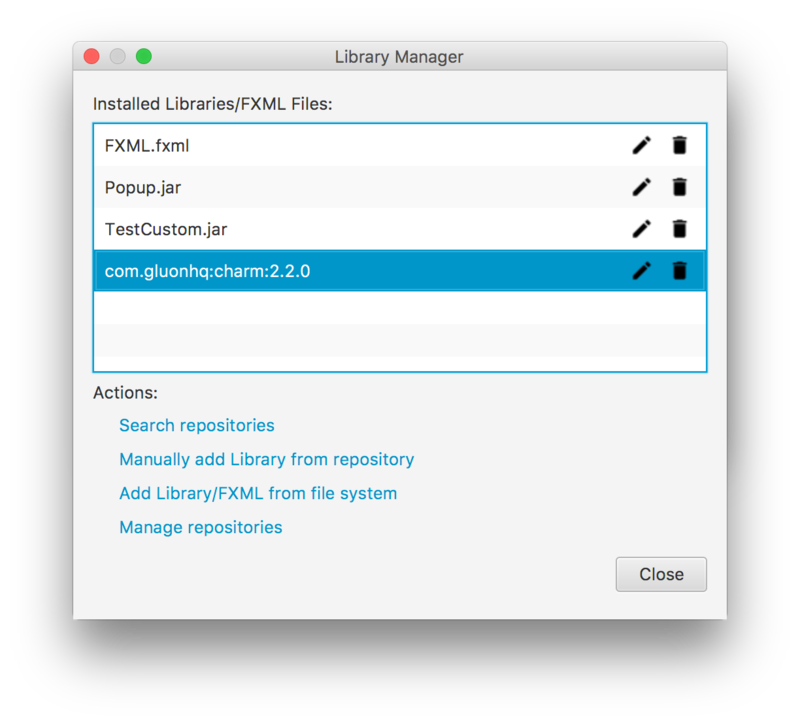 Once the dialog is closed, the new library will show up on the list. Again, it can be edited, to modify the list of included components, or deleted, to remove the jar and its components from the Custom panel. Note: When an artifact is removed from the list, it will just be removed from Scene Builder, but the artifact won’t be removed from the local M2 repository. that can be extended as it will be shown later. 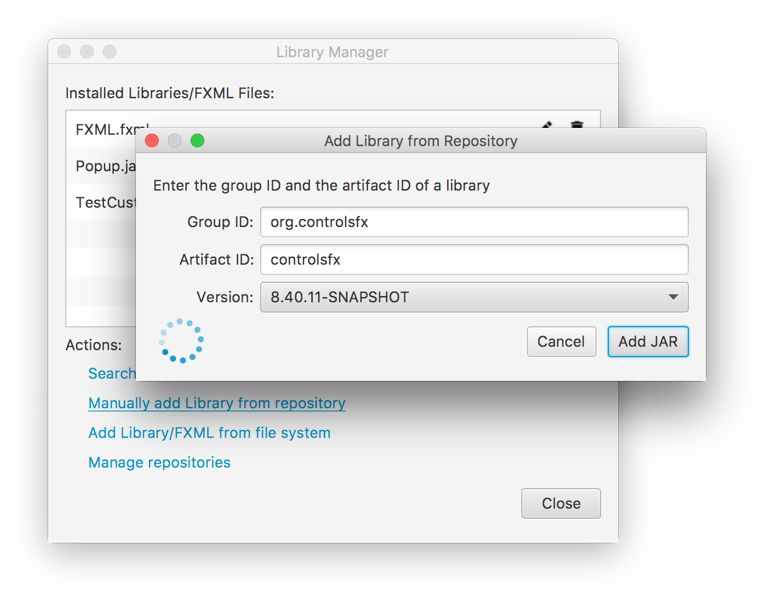 Once a version is selected, clicking Add JAR will resolve the artifact, downloading and installing it into the local M2 repository. The jar will be scanned and available components can be imported, after the user clicks on Import Components. 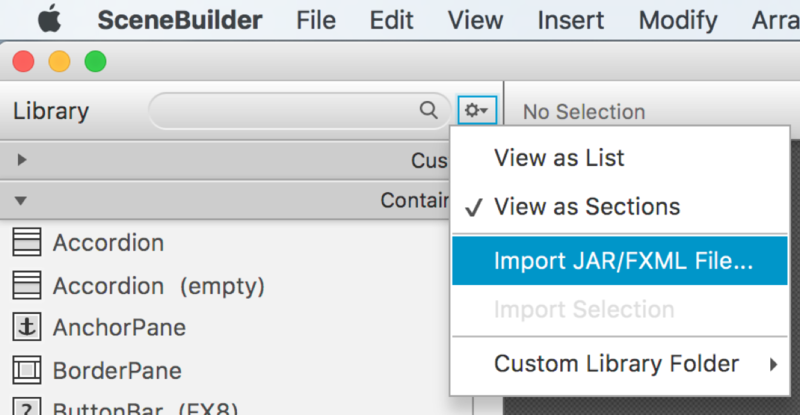 This option allows the user browsing locally for jar or FXML files, as in previous versions of Scene Builder. The files will be installed in the Custom Library Folder. Finally, the user can manage the repositories where artifacts are resolved from. 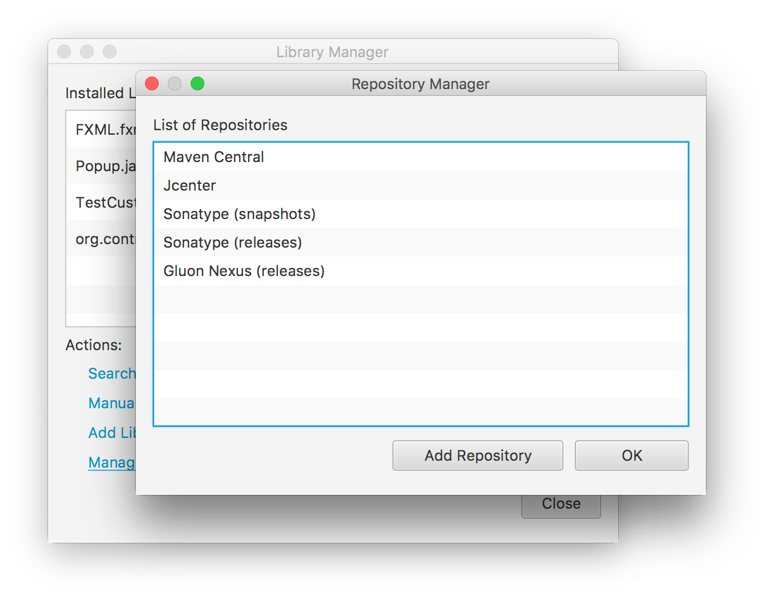 Initially, the preset list of remote repositories is listed. These are not editable and can’t be removed. 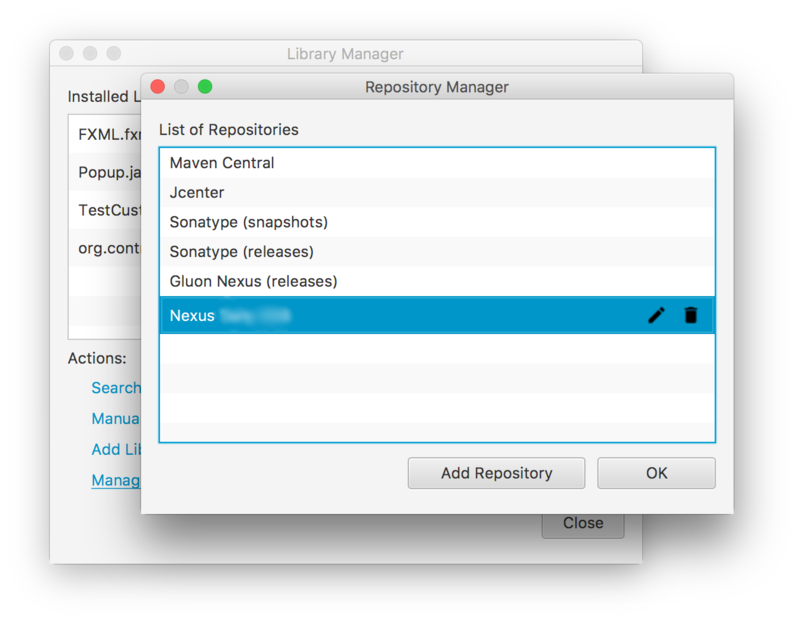 By clicking on Add Repository, the user can add new repositories to the list, both public or private. A new repository requires a name and a valid URL. If it is private, the credentials are required as well. The test button will perform a connection to the given URL to check if it is valid or not, and if private, if the credentials are valid as well. Note: The credentials will be stored locally in the user preferences. They will be used only when installing libraries from the private repository. Finally, the user repository will be added to the list, with the possibility of edition or deletion. 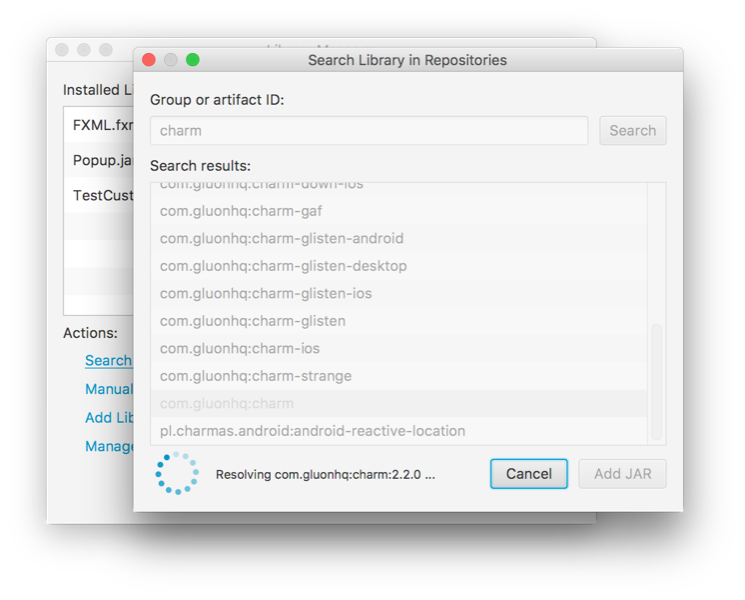 Finally, all the components imported from either local or remote repositories or from the local file system, will be listed in the Custom panel, ready to be used. 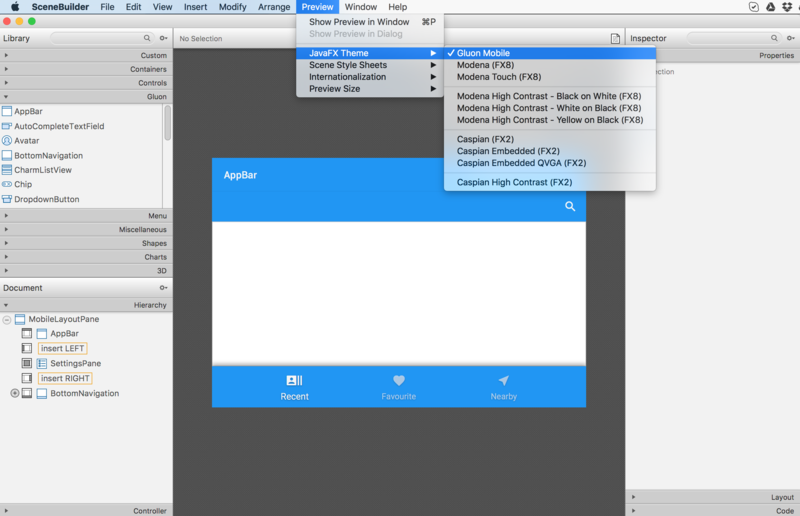 Since Scene Builder 8.3.0, a Gluon Mobile panel is included by default to support the easy creation of mobile apps using Scene Builder and Gluon Mobile. When using Gluon Mobile controls, don’t forget to use the Gluon Mobile preview theme as shown in the screenshot below.